Part of the cultural history of the United States, Southwest style is popular because it has a sense of tradition while still regularly receiving contemporary updates. Featuring distinctive, ethnic styles Southwestern decor is composed of Native American and Spanish styles for a look in tune with the heritage of southwestern states like Arizona and New Mexico. Even if your place doesn’t feature the flat roof, high ceiling with exposed wooden beams, or large open floor plan of traditional Southwestern abodes you can still get this warm and inviting style in your own home. 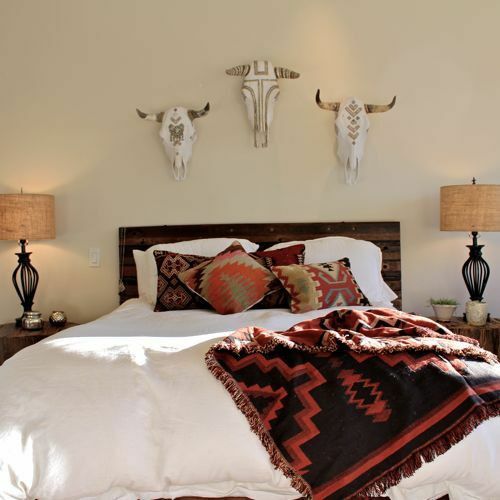 Here are the guidelines to follow for stunning Southwestern style. A big part of Southwestern style is its color palette. The bold bright colors associated with the style are drawn from the land. Cobalt and turquoise blues match the sky, greens represent cacti, and reds, oranges, and yellows reflect the rest of the landscape. Desert-toned neutral hues with shots of bold, bright color are essential to Southwestern style. A Southwestern styled interior should be warm and full of energy. Reflecting its heritage, furniture in Southwestern decors tend to have rustic, distressed finishes. Popular woods used in Southwestern design include pine, oak, maple, birch, cherry, and hickory. Furniture crafted from these woods are sturdy and thick and often feature eye-catching accents. For upholstery leather is one of the more common coverings. Burnished metal is also appropriate for Southwestern style furnishings. Sturdy woven fabrics and striped serapes can be used as furniture accessories or simply hung from the wall. Throws and pillows will both add color, pattern, and texture to your furniture. Look for bold colors and Native American inspired patterns to add a sense of authenticity to the space. While a well-placed rug is one of the best ways to add bold color and pattern to a room a cowhide rug would also fit the Southwestern style. To really nail the Southwestern style make sure to get the details right. Pottery, hand-painted tiles, and wrought iron accessories are all ideal options for an authentic feel. Dried-flowers, dreams catchers, and bleached animal bones/skulls are also traditional decorative accessories. If you don’t want to use real animal skulls or bones there are fortunately a lot of animal-friendly alternatives available these days. Cacti are also always a welcome addition. Original Southwestern walls were made of adobe, stucco, or smooth stone and if desired you can recreate these textures through paint or wallpaper. With a color palette inspired by the landscape and a hint of natural ruggedness, the Southwestern style allows you to think outside the box and add a ton of personality and heritage to your home. The earthy colors and woven textiles can help you feel the warmth of the desert all year, wherever you live.